The news on the Hard Labor Creek water front has not been good lately:sales tax revenues are down; water revenues are down; the drought continues; State funds are gone; and financial markets are not good for bonds or banks. The $ 352 Million estimated price tag is looking bigger and bigger. As one who spent 12 years on regional water issues, I know there will be some unexpected delays and expenses on the HLC project. We had them with the Bear Creek Reservoir which had four partners. The really tough times for HLC are ahead. The re-elected commissioners will be around for some of that stress. Commissioner Don Norris (who lost and leaves office on December 31) will not be remembered when it comes time to “pay the piper” in 2014 etc. Now the debt is a challenge. Some of the Walton and JDA leaders and officials were directly involved in the Four County JDA project as well as Hard Labor Creek. There is no assurance that their judgment or vision was any better for Hard Labor Creek as to cost and benefits. Sales taxes and water revenues will be stagnant for a couple of years or more in Oconee County. The housing slump has hit hard if one really looks behind the headlines. Some say we have an oversupply of homes and subdivision lots. That not only impacts sales taxes but eventually slows the growth of the assessments and tax digest. We all know now that the State is feeling the pinch of declining revenues. The hoped for state grant for Hard Labor Creek did not and will not materialize. Members of the Jasper, Morgan, Newton, and Walton Joint Development Authority (JDA) heard presentations last week from two financial advisors, after learning that the firm that had insured the group’s 1999 $ 9 million bond issue had been downgraded and that the bonds’ heretofore highly preferential interest rate was at risk. According to Bill Johnston of Raymond James Financial Services, five of seven bond insurers in the United States have recently been downgraded from AAA to AA or lower, something that has never happened before in the financial market. “It’s a very, very tough situation,” said Johnston, who was involved with the original issue of the taxable bonds. Over the bull bond market of the past eight or nine years, the JDA’s variable rate bonds have cost as little as one percent at times. …….. the downgrading of their insurer, Ambac, the bonds have moved into what is known as “bank mode,” …………..
To keep that from happening, JDA members voted unanimously to move immediately to secure a letter of credit (LOC) from the Bank of America,…………………. It would take a series of Atlantic tropical storm systems dumping rain all over the state to end the drought, Stooksbury said. "Droughts are cumulative events, and this is the third summer we've dealt with this," he said. "Stream flows are down, and all but the deepest soil moisture is gone. You've started to see a lot of older trees dying, and the ones that were healthy are looking sick. There's some oak trees around town that just look awful - and that's from the drought."…………….. Low river flows mean managers of Bear Creek Reservoir, which supplies water to Clarke, Barrow, Jackson and Oconee counties, have not been able to pump additional water from the North Oconee River to store for the dry months ahead, said Mike Rachelson, interim reservoir manager. The Athens-Clarke government, which usually pumps from the Middle Oconee River, began pumping from Bear Creek after the river levels dropped earlier this month, Rachelson said. The lake was about 4.3 feet below its normal level Monday but holding about 3.6 inches more water than during the same week in 2007, Rachelson said. Despite dropping reservoir levels, most county and city water systems are sticking with their current outdoor watering restrictions, which allow residents to hand water for 25 minutes three days a week and to use sprinklers one day a week between midnight and 10 a.m…………….. Despite torrential rains in much of the area Tuesday night, Northeast Georgia remains in an "exceptional" drought, the worst category. According to the U.S. Drought Monitor report released Thursday, eastern Hall County is still classified as exceptional, along with all or part of 15 other counties, including White, Habersham, Banks, Barrow, Towns, and Rabun. 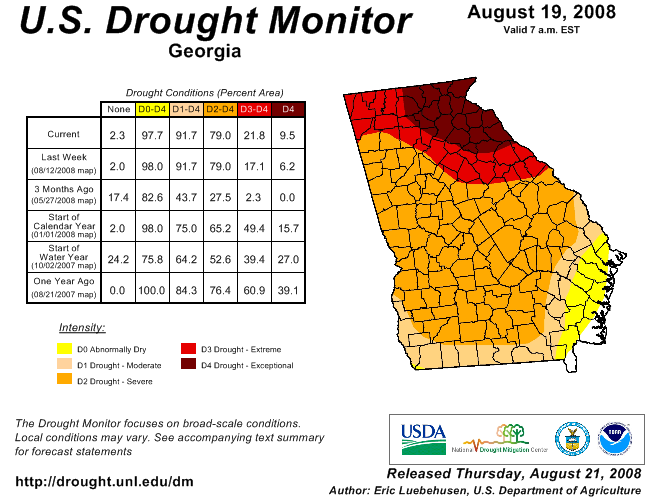 The rest of Northeast Georgia, including West Hall, is in an "extreme" drought, the second worst category. Northwest and central Georgia are classified as "severe," while counties near the coast are only in "moderate" drought. LAVONIA — Expect Hartwell Lake level to go lower – again. The continued dry conditions in northeast Georgia and the Upstate have the U.S. Army Corps of Engineers Savannah District officially initiating their Drought Level 3 Contingency Plan. State officials this week torpedoed a reservoir funding program that leaders in Oconee and Walton counties hoped would pay for a signifi­cant part of the proposed Hard Labor Creek reservoir. Facing a statewide budget crisis, the Governor's Office of Planning and Budget directed the Georgia Environmental Facilities Authority to sus­pend its new $ 40 million com­petitive grant program. Oconee and Walton offi­cials, partnering to build the new $ 352 million Hard Labor Creek Reservoir, had said this summer the project was a shoo-in for some of the money. They asked the state for $ 18 million, more than 10 percent of the project's phase 1 cost, to build a dam on Hard Labor Creek. Leaders in Jackson and Barrow counties, along with dozens of other communities around the state, also planned to compete for the funding. The state this week turned off the tap on grant money it had promised local communities for new water supplies, but that won't sink the Hard Labor Creek Reservoir, officials said. Thanks to bond sales this year, the project has enough money to pay for land, design and construction until 2011, said Oconee County Commissioner Jim Luke - but losing out on a possible $ 10 million grant is disappointing, he said. The Oconee and Walton county leaders behind the new reservoir already had their fingers crossed about the money as state agencies scramble to deal with a $ 1.6 billion budget shortfall, he said. But this week, officials in Gov. Sonny Perdue's Office of Planning and Budget said they would redirect the $ 40 million reserved for the grants to vital government services. The Georgia Environmental Facilities Authority was supposed to award the grants later this year, but Thursday, it notified applicants the program was suspended. After an initial $ 18 million request to lawmakers earlier this year - matching the cost of the project's dam - Hard Labor Creek organizers officially applied this month for a $ 10 million grant. Even the lower request was, by far, the largest one GEFA received. But Luke said Hard Labor Creek officials, who issued millions of dollars in bonds already this year, likely won't need to apply for more loans for some time.